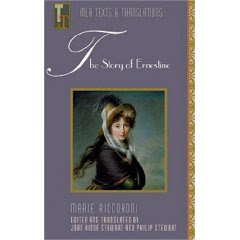 Written in 1765, Marie de Riccoboni's The Story of Ernestine is one of the earliest romantic narratives. At 80 pages, it's a quick read and a charming tale of the love story of the orphaned Ernestine and the wealthy and handsome marquis de Clemengis. Since most of the historical romances I read are set in England, it was a nice departure to read the French setting. You can read the entire first half of the story at Google Books. Now that I'm taking classes on website development and search engine optimization (how to improve your search rankings on popular search sites such as Google), I'll be sharing simple tricks and tips from time to time. Many authors are now choosing to develop their own websites or enlisting web development firms to create websites for them; either way, it's useful to know some of these ideas. Today, the tip is how to check which websites are linking to the domain names that you own. All you have to do is to go to a search engine such as AltaVista and type in +link:your domain name. So, if I wanted to check who's linking to my Sara Freeze website, I'd type into the AltaVista box: +link:sarafreeze.com. I received the following press release in my email today and thought it might be of interest to other writers. Gathersburg, MD – July 16, 2008 – Arrow Publications, publishers of the online romance novel website MyRomanceStory.com, today announced the "Forever After" Romance Short Story Contest. The contest invites readers to continue one of the site's romance novellas to win cash and prizes. "You know, something as simple as 'the end' should not get in the way of a good romance," said Patricia White, publisher. "So we thought, why not let our readers continue their favorite novella and let us know what happens during the 'they lived happily forever' after part?" Contestants are invited to pick any of the MyRomanceStory.com's online romance novellas and write about what happens next in the character's lives. Did they encounter bumps along their road to romance? Did they truly spend the rest of their lives happily together or did the passion fizzle? Were the characters living secret lives we didn't know about in the original novella? Who knows? "We want our readers to tell us," said White. "This is a wonderful way for someone who would like to become a romance novel writer to get their foot in the door and receive some valuable feedback," said White. "We'll be judging the stories on creativity, faithfulness to the original story and characters, strength and appeal of the romantic elements, and the overall writing." Submissions are due August 31, 2008, and must be between 2,000-2,500 words. The story line should focus on the challenges the couple face after the novella ends, and what circumstances occur to fortify their love for each other. The writer of the winning story will receive $250 in cash, a $25 gift package, a two-year subscription to MyRomanceStory.com, and a written critique by one of the sites' editors on another of the writer's short stories or a sample chapter from a novel. Cash prizes will also be awarded for the 2nd through 4th place winners and 10 honorable mentions. In addition, visitors to the site can read all qualified submissions and vote for their favorites. The top vote-getter will receive the Reader’s Pick prize valued at $25. To enter visit www.MyRomanceStory.com/foreverAfter/. All qualifying submissions will be posted on the site. MyRomanceStory.com, the premier online romance graphic novella site, is published by Arrow Publications, LLC, a 24-year old Potomac, MD corporation. In addition to graphic novellas, MyRomanceStory.com features lifestyle columns, book reviews, online shopping, a reader blog and quarterly newsletters. The site is enjoyed by millions of readers worldwide. For those of you who are unfamiliar with the romance-writing website Roses Colored Glasses, I encourage you to check it out. They have newsletters, writing advice, and workshops, all of which are very inspiring for the new and established writer. This month, their newsletter features Rhonda Penders from the Wild Rose Press. I especially like Penders' advice to actively seek support from other writers. The writing process can be lonely sometimes, and I've found it helpful to network and socialize as much as possible with the writing community.